The Pittsburgh Vintage Grand Prix is a multi-weekend event that has been in operation for over two-and-a-half decades. It is a ten day celebration packed with car shows, dinners, parades, races, and numerous other activities. It is the largest volunteer-based event in vintage racing and the longest running vintage race event in the nation, now celebrating its 27th consecutive year. The first event was a kick-off Rallye which had car enthusiasts match their driving skills against a 'mystery course' through the streets of Pittsburgh, PA. It was an activity that tested both driving and navigational skills. 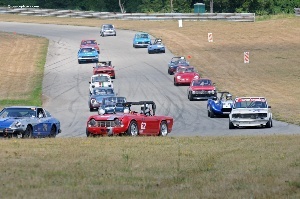 The next event in the 10-day celebration was the 7th Annual PVGP Historic Race at the BeaveRun MotorSports Complex track. The BeaveRun Historics is a welcomed compliment to the PVGP, as it provides a second racing venue which attracts an even wider audience of drivers and vehicles. Unlike the PVGP course, the BeaveRun circuit is very forgiving with sand traps and plenty of run-off areas. The PVGP is run through Schenley Park - and although every precaution has been taken to make the course as safe for drivers, spectators, and the cars - it is a public park and there are trees, barriers, and obstacles which could potentially do harm. With the BeaveRun circuit, risks are lower which occasionally fosters greater speeds and another variety of vehicles. BeaveRun's North Track is ideally suited to high performance driver training, racing of all types, vehicle demonstrations and testing. The track is 1.5 miles in length and has 12 turns. With a layout that flows over hilly natural terrain, the course offers exciting elevation changes and several blind-entry turns that challenge the abilities of drivers and riders alike.